Last night neither transparency nor seeing was good. 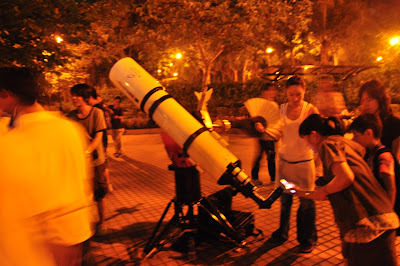 However, it was a year of International Astronomy’s monthly activity, sidewalk astronomy. The activity was held in Tin Shui Wai, which is far away from Tseung Kwan O. I was happy to join the activity because my wife decided to go with me. When we arrived virtually all the telescopes were pointing to the moon. This was the brightest object that could amaze the general public. 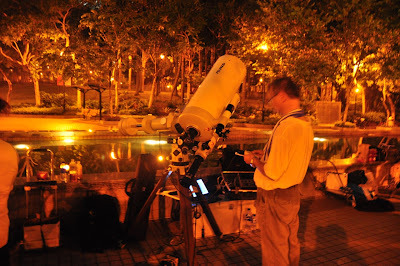 The most interesting thing for me to join this activity was I can have a chance to try different telescopes. The biggest telescopes are always eye-catching, the TMB 8” APO and the Takahashi M-250. Just an impression, the TMB 8” APO gives better contrast. I couldn’t tell the different between sharpness because they were using different eyepieces and the magnifications were different. Anyway the Ethos eyepiece was impressive in terms of view angle. I just wonder my eye’s view of view is too small compared with Ethos FOV! It just gave you a feeling of cruising around the moon. One cannot describe the FOV of an airplane’s window! Well all these, 8” APO, 10” Takahashi and Ethos, are expensive. I deliberately look at some down to earth telescopes. Believe it or not, Sky-Watcher 5” Maksutov-Cassegrain was really good. The image of the moon was crispy and the contrast was high. I remembered once there was a used one in the forum a few months ago. The owner asked for $1700 if I remembered correctly. Hmm…. I missed a chance. After I walked around for a while in Tin Shui Wai, I decided to go to have my own star gazing. I rang my friend Lewis and our destination was Lung Ha Wan. We arrived at Lung Ha Wan at about 10:30pm. But the favorable location was occupied by some midnight divers! Gee! We wanted to try a new location, but it was just being occupied by others! Anyway, Lewis and I looked around and see if it was a good location for star gazing. But sky was very hazy and we could only see the Vega, the Jupiter and the moon. As there were no favorable car parks, we decided to go to good old Pak Tam Chung. When we arrived Pak Tam Chung, there were no star gazers! I was fooled by those posts in the forum. Maybe everyone went to Tin Shui Wai. Well! We two lonely twins stated to setup our scopes and practice. The sky condition became very bad. When we arrived we could see the blurred moon, the fading Vega, the dim Polaris and Perhaps the bright Jupiter. I tried to setup the HEQ5Pro as quickly as possible. At the point I wanted to do the polar alignment, the Polaris was gone! So I used the compass to solve it. Unexpectedly the alignment done was quite good. The tracking of Jupiter was good. 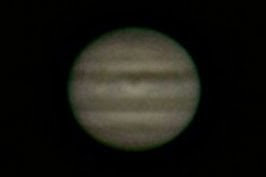 We shot the Jupiter with different imaging device, D90, 450D, SPC900NC and LPI. Both D90 and 450D have life-view which was very useful in focusing. But all the photos taken by D90 were unsatisfactory! We don’t know clearly why D90 failed. Maybe it was because of the flip mirror of D90 in the life-view mode flips before the release of the shutter, while 450D not. The small vibrations of flipping the mirror caused the burred images. As a Nikon user, I need to figure it out! This needs another investigation. My second task was to align the NexStar 4SE mount. It just couldn’t track the sun probably during the recent solar eclipse. I believe that ex-owner didn’t get it alignment in 2-star alignment or 3-star alignment once. According to the manual, one needs to get NexStar alignment once with at least 2-star alignment once before it works properly. However the noxious clouds covered the sky. You know! Finally I gave up and went to have dessert in Sai Kung. Today I tried to process my photos. I still don’t know how to use Registax. The photos shown were just click-click-click product. Concerning Registax, it's simple to use, I usually keep everything as default and there's nearly no trick to use it. All you need to do is to find a frame which is relatively sharp to start with, and click on a high contrast feature as the alignment point. High resolution planet imaging requires much patience, you need to sit there and get a cup of juice or coffee for yourself, wait for moment of better seeing. Other than that, spend more time to collimate your scope, and to refine the focus, SCT could be very hard to focus due to the very fast primary. Thanks for telling. One of ur Jupiter photo with C5 was really stunning! As u mentioned it was even better than most photos taken by C8! u know my Jupiter photos seem rubbish compared with yours. So I am trying to located the problem. Is it from my focusing skills? Sky condition? Not properly collimated optics? Poor Registax skills etc. So if I can use one of ur avi file, which is proven to be good, I can figure out whether the problem is from Registax skills or not. 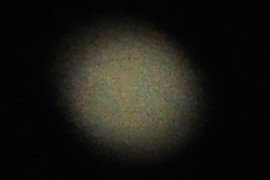 Its so much fun.I have also don it with a friends telescope,It was of great fun.